There was a bowl at reception filled with candy from Hallowe'en. "Rockets!" I exclaimed. I was encouraged to take some. I stuffed my pockets! Did you know that Rockets were made by Eddie Dee? 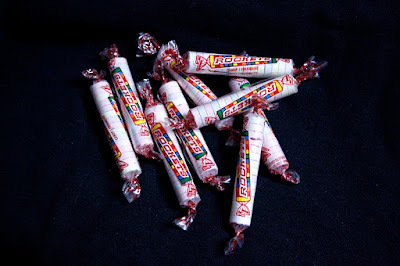 The Ce De Candy Company Limited, now known as Rockets Candy Company, started making Rockets on Queen Street, Toronto in 1963.